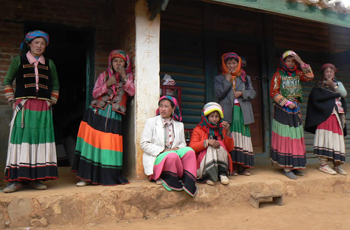 Dr Amanda Harris, research fellow in the Graduate School for Health Practice, has recently returned from southern Sichuan where she has been researching maternal health care practices among two of China's minority populations. This research was funded by a Charles Darwin University (CDU) research grant and carried out at the request of partners of the Gradate School in China who are working with CDU on the Australian Research Council funded ‘Improving Birth Practices in China’ project. Dr Harris explained that the maternal health services in this mountainous region of China are poorly resourced and remote health centre staff struggle to provide the most basic of care. ‘While the goal of the central Chinese government is to achieve a 100 per cent hospitalisation rate for births, most births in these communities continue to occur in women's homes with the help of traditional birth attendants. ‘Drawing on data from over 60 interviews with local women plus numerous health care professionals and administrators, our goals is to provide recommendations at the local and national levels on ways to improve the delivery of maternal health care to minority people,’ she said. Findings from this research and the ‘Improving Birth Outcomes in China’ project, will be presented in Sichuan in September 2007 at a meeting that will bring together World Health Organisation (WHO), The Ford Foundation, UNICEF, UNFPA and project partners from both Australia and China.